Prepare for success on your HESI exit exam and the NCLEX-PN®! 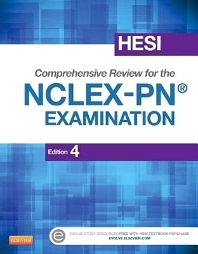 The HESI Comprehensive Review for the NCLEX-PN® Examination, 4th Edition provides a complete, all-in-one review of the information you need to know. Written in an easy-to-read outline format, this study tool breaks down chapters by clinical areas and topics emphasized on the NCLEX-PN exam. Rationales are provided for incorrect answers and help you address any areas of weakness. The companion Evolve website offers 500 practice questions, giving you valuable practice in the same electronic testing format you will experience on your nursing school exit exam and on the NCLEX-PN exam. Detailed rationales explain correct and incorrect answer options for practice questions. HESI Hint boxes highlight important clinical information and concepts commonly tested on the NCLEX-PN exam. Pharmacology tables summarize the need-to-know drug therapy content emphasized on the NCLEX-PN exam. Chapters organized by clinical area make it easy to find and study review topics. The Evolve companion website includes 500 NCLEX practice questions, including alternate item formats, providing a testing experience similar to the nursing school exit exam and the NCLEX-PN licensure examination.